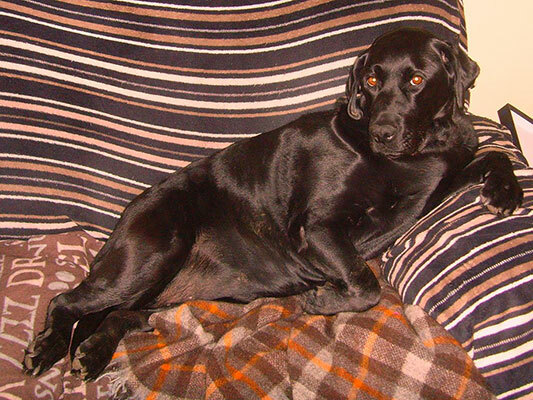 Holly was the much loved and adored black Labrador of her Human, Lesley. In the first four years of Holly’s life she had been a victim of terrible neglect and shunted from home to home where nobody looked after her properly. She came to live with Lesley in June 2008, a very sick and sorry soul. Slowly but surely, she was nursed back to health and soon, the pair became inseparable. As Holly’s health improved her cheeky and playful nature emerged and at last, she began to enjoy life. She became a bit of a spoilt Diva and loved lazing about on the couch at home. If out playing, any time Lesley threw a ball for Holly she would look at the ball, then look back at Lesley as if to say ‘well you get it!’ She was not one to exert herself if she didn’t have to, but she was an incredible dog and loved very, very much. Despite working so hard to improve her health, the years of neglect Holly suffered in her early life left her with a multitude of ailments that we worked so hard to keep at bay. Sadly, however, Holly lost her fight for life on May 29th, 2013 and her passing has left a big Holly shaped hole in the lives of all who knew her. ‘Holly’s Hugs’ was set up in her memory and as a tribute to her. Its purpose is to help raise funds for dogs in need, especially elderly and special needs dogs who can’t be re-homed and dogs working in and rescued from war zones. ‘Holly’s Hugs’ also aims to promote the wonder of the human-canine bond and how hard it can be when we suffer the loss of our beloved furry companions. ‘Hugs from Holly’ will be sent around the world in the form of special goody boxes full of treats and toys.